Human interaction with technology is enormously productive of stories. It has often been noted that much humor, especially visual humor, derives from the resistance of made objects to the human will: consider the silent films of Charlie Chaplin and Buster Keaton. But this resistance can be the stuff of tragedy as well, when the maker is hurt or killed by the constructed thing; and also when we fabricate things to control others. Join a person and a technology and you have some kind of story. The Best Technology Writing 2010 is full of good stories: stories about Twitter and Facebook and other online distractions, stories about GPS devices and telegraphs and handwriting and newspapers; also gadgets to assist breastfeeding women and affordable stoves for poor people. 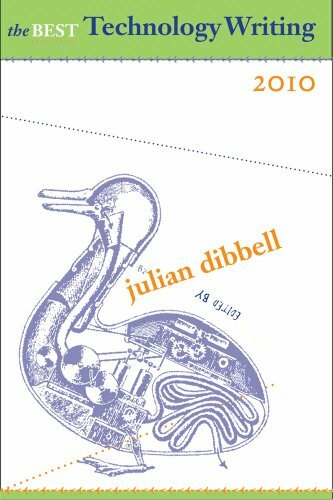 Julian Dibbell, the editor of this volume, has chosen well; I enjoyed every story in the book. Yet I also found myself longing for someone to make sense of all these stories. Perhaps the only essay here that strives to offer anything like a general account of Tech Life is Kevin Kelly's "Technophilia," but, while it offers a thoughtful description of our love for technology, it resounds with Kelly's characteristic insistence that the objects we make are effectively sentient: "Technology wants to be loved." More, Kelly always assumes that what technology wants it can and should have; resistance is, at best, futile. We get more nuance from James Harkin's "Caught in the Net," a meditation on the relationship between communication and power that centers on the 2008 presidential election, but Harkin is presenting questions rather than offering answers. Which is perfectly appropriate; indeed, every story here does what is perfectly appropriate. A narrative can succeed without offering its own philosophical commentary; and indeed, narratives that do offer their own philosophical commentary tend not to succeed.